Jason Randall is a veterinarian certified in fish health and medicine. He is also a member of the World Aquatic Veterinary Medical Association and the Society for Freshwater Science. 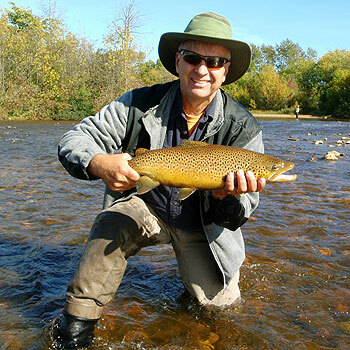 He has been an outdoor writer for the last ten years with articles appearing regularly in American Angler, Eastern Fly Fishing and many other outdoor magazines. Jason Randall has done a thorough study of the effect of current on trout, their prey species and presentation. Learn how to deal with vertical layers of current that create drag and the adjustments required to improve nymph fishing success. Jason Randall fishes with fly fishing giants such as George Daniel, Landon Mayer, Lefty Kreh, Ed Jaworowski, Ed Engle, Gary Borger, and Joe Humphreys and on this show Jason will share their top nymphing techniques, flies, and tactics. Randall covers everything from rigging flies, reading the water, casting, and fighting fish. Join us to see what Jason has learned from fishing with the masters. His first book, “Moving Water: A Fly Fisher’s Guide to Currents” was released in 2012 by Stackpole/Headwater books. It studies the effect of current on trout, their prey species and presentation, where vertical layers of current create drag and requires adjustments to improve nymph fishing success. His second book “Feeding Time: A Fly Fisher’s Guide to What, Where and When Trout Eat,” was released in the August of 2013. It focuses on matching your fishing strategies to the trout’s feeding strategies, especially when targeting large trout because if you know the five ‘W’ questions for large trout feeding- who, what, when, where and why, you can catch them regularly.